The Union 4 Life group has struck again, this time raising and contributing $12,000 to breast cancer research at the University of Michigan Comprehensive Cancer Center. Over the past three years, the group – started by IBEW Local 252 apprentices – has raised $31,000 for U-M’s research. This year fundraisers included a motorcycle poker run, golf outing, casino bus trip, bowling night and archery shoot. Salyer said the money was raised this year with the help of a number of other unions, “with a special shout-out to the Carpenters.” A big check was handed over to U-M on Nov. 9. 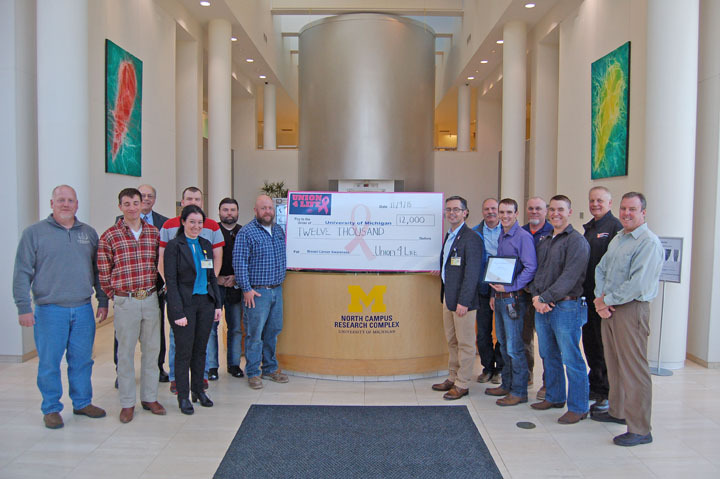 A big $12,000 check from the Union 4 Life group was delivered to the University of Michigan Health System Office of Development on Nov. 9 to support breast cancer research. Among the attendees (l-r) are IBEW Local 252 Training Director John Salyer, Martin Grove, Mike Crawford (NECA), Dr. Costanza Paoletti, Alex Hovatter, Brandon Linnabury, Chairman Harry Hutchison (Huron Valley Electric), Jason Keech (Uo-M), Lew Neeb (252 instructor), Mike Crawford, Mike Cobb, Kevin Lyons, Gary Walls (JATC) and Dr. James Rae.